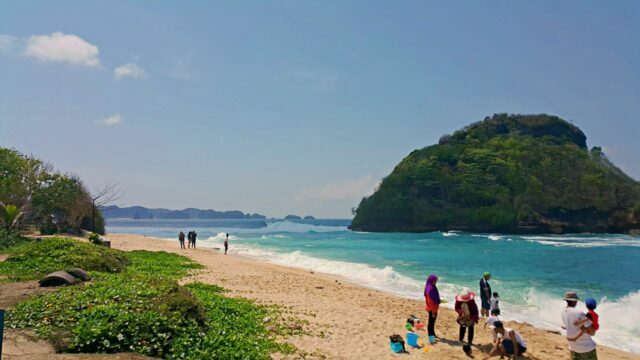 Goa Cina Beach might not be as famous as other beaches in Malang, East Java. That probably has something to do with its tough access and dangerously strong currents. The ferocious swells of the Indian Ocean crash on three small islands near the shore. It is like a warning to everyone to keep away from this watery rage. 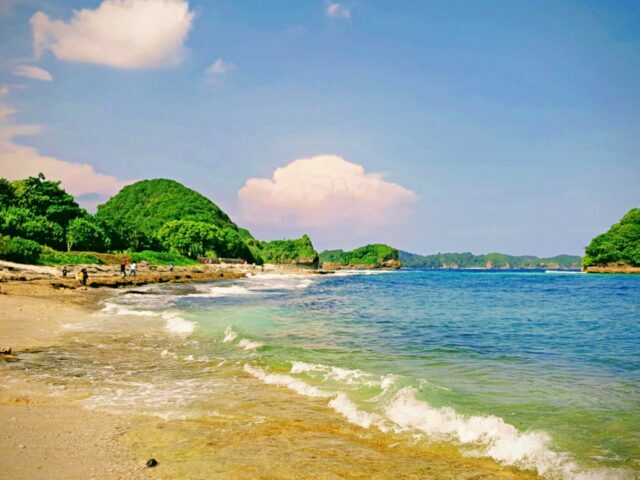 Nonetheless, this natural beauty on the southern side of Java is a tourist magnet. Its white sand feels warm and smooth and it tickles the toes. During low tide, the sea retreats to the horizon, leaving gaps in the sand. Water fills those stripes of gaps, along with some fragile starfish inside. Only at that moment, beachgoers can clearly see the green water surrounding the scattered islands. The name goa Cina, China cave, has its own story to tell. Rumor has it that long ago there was a Chinese hermit meditating inside. Time passed and yet the man never showed up, not even once. Locals then entered the nook to find him but they discovered human bones instead. Some Chinese writings were also in the scene, near the remnants of the hermit. There is a rare natural phenomenon taking place in its very water. The tides from different directions meet in one point: between Nyonya Island and Bantengan Island. They come from the west, south, east, and they go head to head every day. As a result, the currents will clash and crash with each other. This “violence” creates thunderous sounds—so loud that those can be heard from the shore. To tell the truth, it is not actually a cave; it is a nook. It’s two meters high and two meters wide, hiding beneath massive rocks on the shore. There is a narrow “alley” that goes eight meters deep into its dark interior. The sand from the beach completely covers the nook’s flooring like a carpet. It has no protruding stalactites and stalagmites, physical characteristics of caves in common. A red Chinese lampion is hanging on its ceiling—perhaps to accentuate the Chinese atmosphere. It gives a colorful contrast to the cranny’s rough, uneven, black walls. Curious wanderers often go inside this dry echoing niche to take a look around. It is about 50 meters from the coast, up to the rocky hills. Goa Cina Beach offers stunning views of the sunrise every morning, especially when it’s not cloudy. The pitch black sky slowly turns to purple as the dawn breaks. As the sun climbs up, the sky gets reddish with a hint of orange. White clouds begin to dance as the bright blue sky pushes the darkness away. The sea reveals its lighter color; a harmony of blue and green. It is undoubtedly the most ideal option for sunrise seekers so they won’t be late. In addition to being romantic or adventurous, sleeping at the beach is fun! Let the repeated sound of the breaking waves be a lullaby to a deep slumber. In the morning, the chirps of seagulls should make an effective alarm. 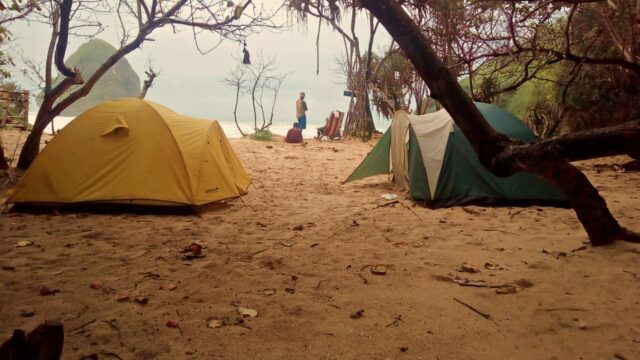 Goa Cina Beach provides a camping ground on the coast, just by the ocean. To erect a tent here, all campers need to pay Rp 10,000 per person. There are public bathrooms and restrooms, food kiosks, and little mosque mushola. Campers can safely park their vehicles in the parking area close to the camping ground. Do not leave Goa Cina Beach before spending some money on the recently caught fish. The local fishermen make their living by selling the critters from the deep. Various kinds and sizes of snappers, groupers, etc will make great seafood to enjoy. Many vacationers would love to buy some of those to cook into mouthwatering dishes. 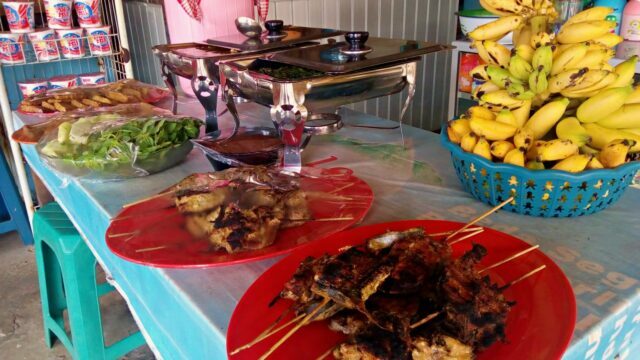 Other than succulent and juicy raw fish, locals also sell fish-based snacks and chips. These cheap yet nutritious munchies are salty and savory—very addictive indeed. Most tourists buy the chips made of fish skin for their sweet and salty sensation. Those crispy crunchy pick-me-ups taste even better with a dipping sauce or plain white rice. Goa Cina Beach welcomes all travelers every day, 24 hours each day. However, the ticket counter is open during working hours only. Read: Mount Bromo Sunrise and Hundreds of Stairs To The Crater. Local and foreign tourists pay the same amount of entrance fee; Rp 5,000 per person. As for the parking fee (which is also cheap), one motorcycle costs only Rp 2,000. One car, or other vehicles with four wheels or more, costs Rp 5,000. See: Three Colors Beach A Trek Through The Wild and Conservation Area. The beach provides a camping ground. 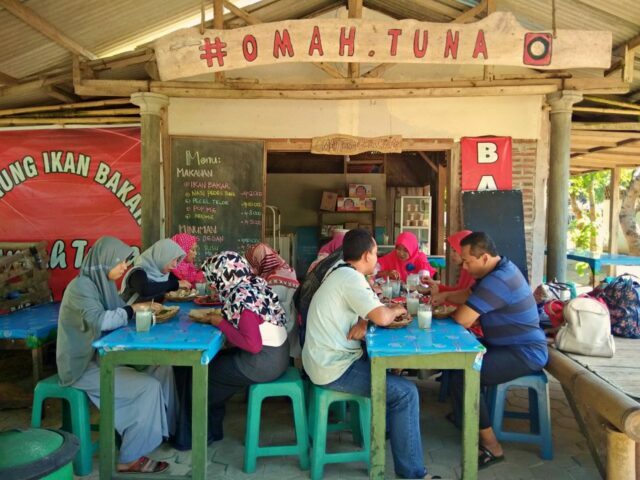 Modest eateries along the shoreline as well as public restrooms and bathrooms are available too. However, there are no hotels or fancy resorts around the area just yet. Therefore, families with children or elders might find this beach uncomfortable to spend the night. For adventurers driving their own car or motorcycle, start the journey from Malang. Head to Jalan Gadang and continue to Bululawang, Turen, and Sumbermajing Wetan. Next, go to Sitiarjo and follow the directions to get to Sendang Biru Beach. At the Sendang Biru Beach intersection, make a right turn to Goa Cina Beach. As for backpackers traveling by public transportation, take an angkot Arjosari – Gadang from Arjosari Terminal. Stop at Gadang Terminal to catch a minibus bison to Sumbermanjing Wetan or Sendang Biru. Stop at Sendang Biru Terminal and get a motorcycle taxi ojek to Goa Cina Beach. Nevertheless, it is much convenient to reach the destination by private, or rented, vehicles instead. The China Cave and Beach location are right at Tambak village, Sitiarjo, Sumbermanjing, Malang, East Java 65176.